Canada and New England will welcome the 2,700-passenger Disney Magic for the first time this week, when she sails into the region for the first of nine five-night voyages taking in Halifax, Nova Scotia and Saint John. 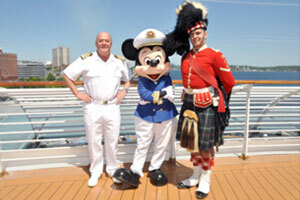 “Canada and the New England coast are alluring destinations for our guests,” Disney Cruise Line Captain John Barwis said. Captain Barwis and his shipboard officers welcomed local port officials and community leaders aboardDisney Magic for the traditional plaque exchange ceremony on her arrival into Halifax and Saint John. “It’s an honour for us and our tourism partners to host Disney – one of the world’s most iconic brands – for the 2012 cruise season,” Halifax Port Authority manager of cruise development Cathy McGrail said.